We just learned about the territory of American Samoa. Another American territory is Guam. Guam is in the Pacific ocean, north of Australia. 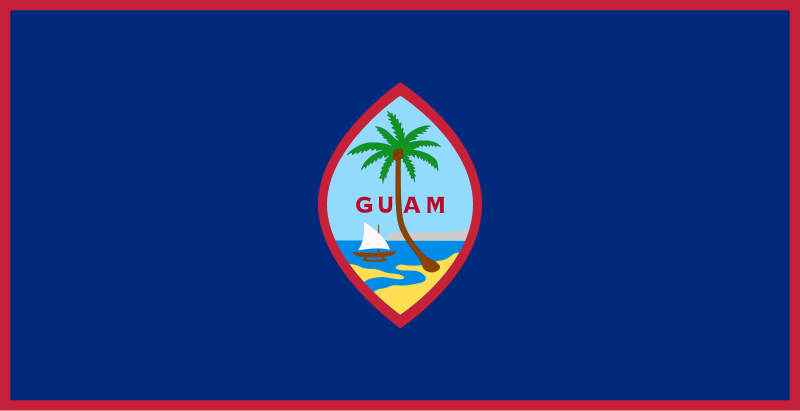 The flag of Guam has a blue background, a red border, and the seal in the middle. The seal is shaped like a type of stone called a Chamorro sling stone, which was used for hunting. On the seal are a coconut, a boat called a proa, a palm tree, a river and the Agana Bay. There is a high place on the island overlooking the ocean called Puntan Dos Amantes. There is a peninsula on the island that sticks out and makes an area called Apra Harbor that is very nice for ships to travel in and out of.